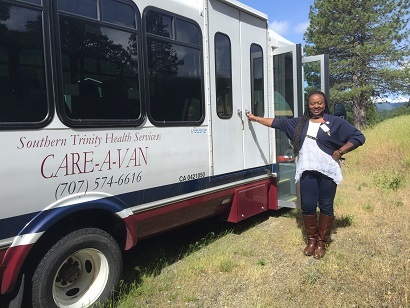 Southern Trinity Health Services is pleased to provide transportation services for the southern portion of Trinity County and the southeastern portion of Humboldt County serving the following communities: Bridgeville, Dinsmore, Hayfork, Hettenshaw Valley, Mad River, Ruth, Swains Flat and Zenia. The service is available to all residents and visitors, not just patients of our health center. Due to limited seating, we advise you to call ahead at (707) 574-6616 ext 261 to reserve seating. Weather permitting, the following services are currently available: Arrives and services the Eureka/Fortuna area with stops dependent on rider needs. Reservations requested so we can determine the route ahead of time. (9:15AM), Bridgeville (9:45AM) and Swain’s Flat Outpost (9:55AM).